Each workshop is uniquely different you may attend one or as many as you choose. One day retreat/workshop offering the opportunity to be in relationship with a herd of wise gentle hearted horses within the sacred realm of nature. Explore what truly has heart and meaning for you. Expand your capacity to be more fully present to the moment. Reconnect with your aliveness and creative spirit. The focus is not on riding and the work takes place on the ground. No Horse experience is necessary. Horses embody instinct, power and grace. They inspire our dreams and awaken creativity. Interactions with horse wisdom and empathy brings us closer to our instinctual self. Relationship with these magnificent beings is a sacred privilege. Nature soothes the soul and is an abundant source of creative and healing energy. As we dwell in nature and enter into silent dialogue with her we also enter into quiet dialogue with ourselves. Within the sacred power of nature familiar patterns are often challenged and resources untapped become available. Human relationship with Horse and Nature expands our capacity for focus, intention and integration to help ourselves and others embody the gifts of self empowerment, self healing, and spiritual awakening. Rojo is a chestnut mare, an elder around 34 years old. She is respected in her quiet but determined way. She is a good teacher of going after what you want. Spirit is a is a joyful, affectionate, mischievous 6 year old black and white paint mare who lives up to her name in her liveliness and hearted. She and reminds us to kick up our heels and play. 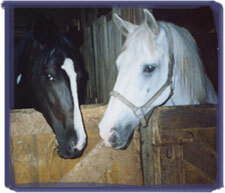 Thunderheart is a white magical horse with a generous presence, empathetic heart and sweet nature. He pulled a wagon to Cleveland from the commune "The Farm" in Tennesse. He has been featured as an artist in magazines for his painting talent. Jackie Lowe Stevenson MSSA LISW, EAGALA; Psychotherapist & consultant, teaches at CWRU and Gestalt Institute in Cleveland, Mexico and Israel. Individual Sessions with Jackie and the horses available by appointment.